Like you, we at AE911Truth are dedicated to exposing the truth behind the events of September 11, 2001. For eight years, we have advanced this goal through broad education of the public, the media, elected representatives, and technical professionals. Join us today as we embark on the boldest phase yet of our 8-year history – the uncharted waters of the ReThink911 campaigns that will go viral on the internet targeting architecture and engineering professionals as well as academic institutions. These target audiences are among the millions who, this year, will find themselves confronted with the irrefutable video evidence of WTC 7’s catastrophic destruction. Why? 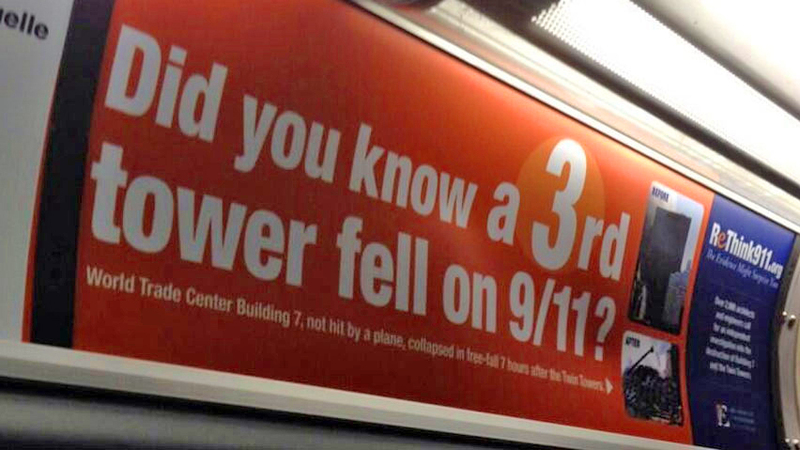 Because you’ve asked us to not just continue the successful ReThink911 ad campaign – but take it to the next level in 2014 – to the computers used by those who are in positions of influence in technical circles. This is the second strategy of our Bold Agenda in 2014. 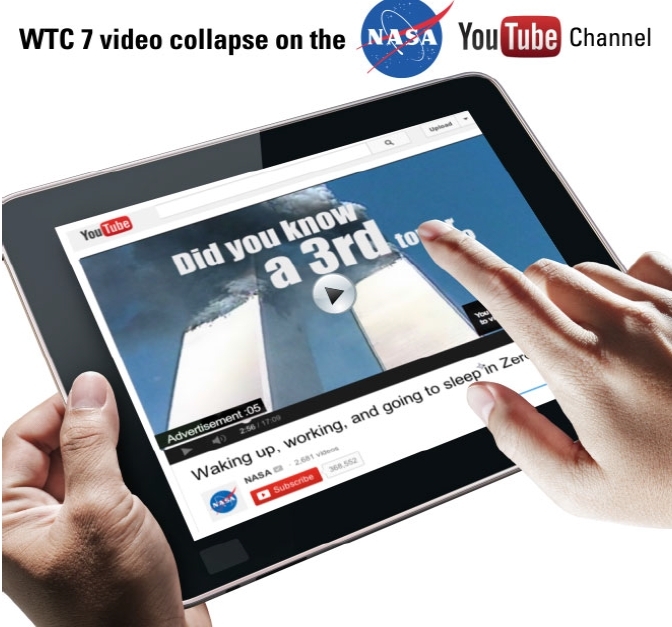 We are asking you to help us put the video of the free-fall collapse of WTC 7 in their faces. You can do this by becoming a member of AE911Truth in 2014. You can make it happen with a humble donation to AE911Truth for as little as $2.50 / month, and yet, this could very well amount to something as large as saving your country! 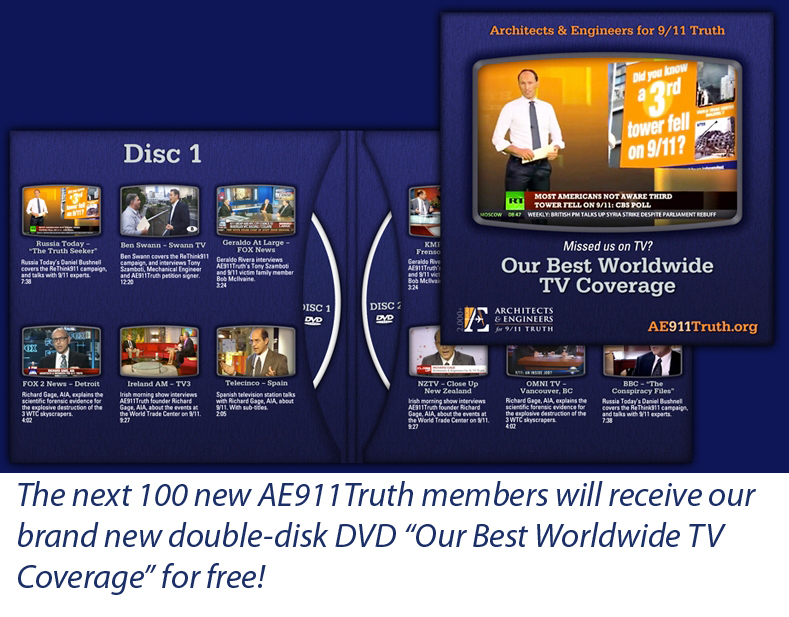 Should you choose to make a donation, we will reward your support by sending you our new remarkable 2-set DVD, "Our Best Worldwide TV Coverage," that you can show to everyone you know. These are the AE911Truth TV interviews that alerted millions around the world to what really happened on 9/11. Forward this Membership Action Alert to your supportive friends, colleagues, and action groups. Be among the next 100 supporters to become members, and we will also send you one of the actual ReThink911 Ottawa bus ad posters from our September 2013 campaign. 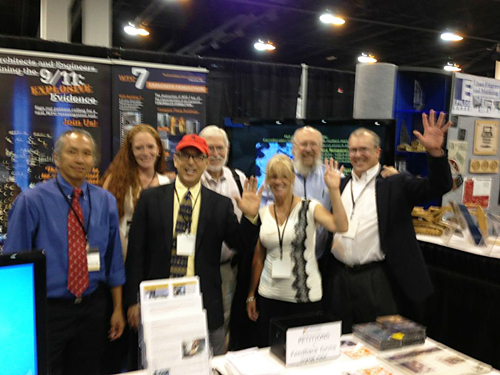 In 2014, we will also attend many more conventions and conferences for technical professionals. The more supporters who become members, the more events we will be able to attend. And with each event we will reach many more professionals – join us and we will reach tens of thousands this year. Our success in 2014 depends on you! Why? 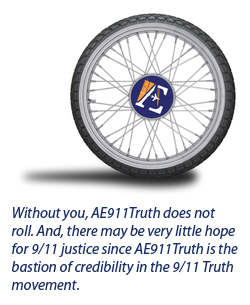 Because with you, AE911Truth is a powerful wheel of action – and we are on the 9/11 Truth highway. You are the spokes in that wheel. Please, stand with us, united in purpose, because we cannot afford to fall short this year. The stakes are too high.